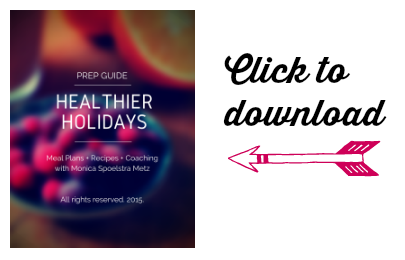 You’ve successfully registered for the 2015 Healthier Holidays program! I’m so glad you’re here — and I’m excited to get started. The program’s official start date isn’t until Sunday, December 5, but I wanted to cover a couple of things so you can get prepared for a productive program. The prep guide includes some checklists and tips for setting up a clean kitchen, and getting prepared for a healthier holiday season. It also includes some sample recipes so you can get started right away. You’ll find the link below. A consistent meditation practice can help you get traction this holiday season — or for any other goals or intentions you may have. There are countless techniques and approaches out there, but you could start simply by sitting quietly for 5-10 minutes, and observing your breath as it flows in and out. My personal favorite method is to use the Headspace app for smartphones. Headspace is super accessible, sometimes involves fun animations, and the co-founder Andy Puddicombe (the voiceover on the meditation exercises) has a great voice. You can click here to sign up for free, and sample a 10-day meditation program. It sounds so simple, and yet it’s so powerful. The more vegetables you have on your plate, the better off you’ll be — especially during the holiday season. 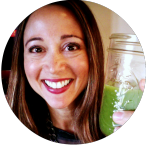 All of the extra fiber and antioxidants will help detoxify the body, and support the immune system. I’ll be in touch later this week — your Week 1 Meal Plan and Recipes will be ready on Friday, December 4. In the meantime, please let me know if you have any questions along the way. Please click the image below to download your Prep Guide. Questions? Special Requests? Drop me a line! Here’s to a Healthier Holiday season!